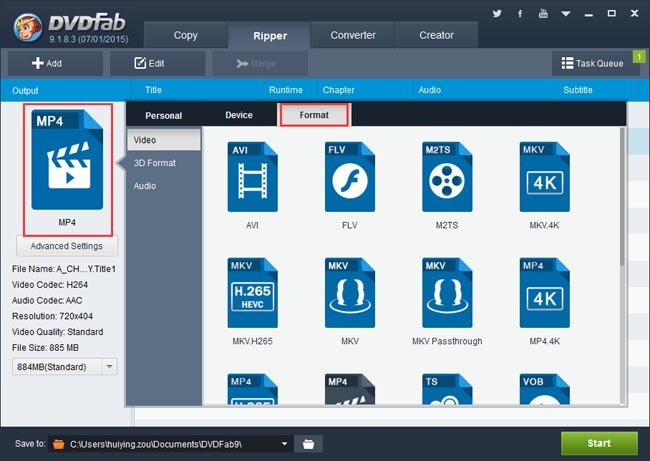 If you’re scratching your head about which DVD decoder to use for converting your DVDs to videos for playback on your devices, you’ll be interested about this article of DVDFab DVD Ripper. It is a very powerful DVD decoder and the DVD source can be converted to virtually all video/audio formats to meet the requirements of different playback gadgets. What’s more, it is a free DVD decoder within the 30-day trial period. Just download it and give it a shot. You’ll be impressed. 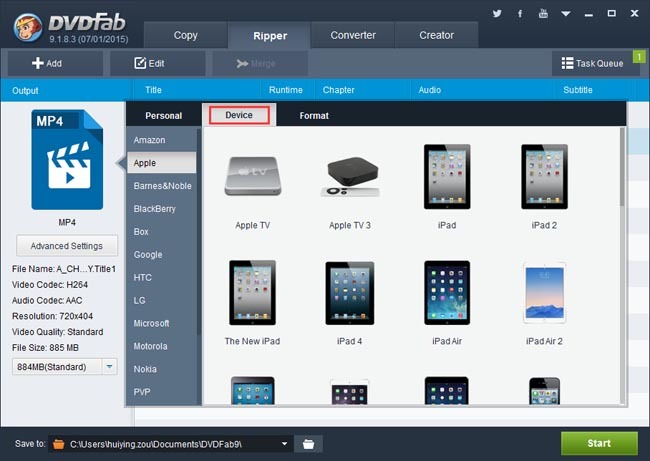 How to use DVDFab DVD Ripper after download and installation? Let’s get started. 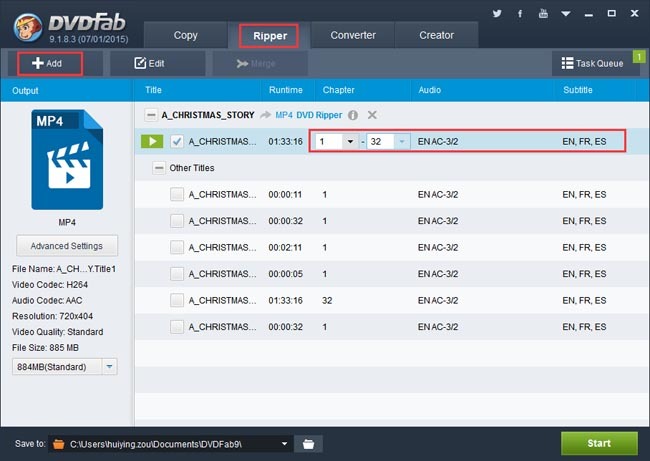 Run DVDFab and go to Ripper option. Then insert the DVD disc for conversion into the DVD drive of or connected to your PC. If the source is a digital file, just click Add button to load it in. One or two seconds later, you’ll see the movie is imported in, and the longest title has been automatically selected. You can change its start/end chapter, the audio tracks and subtitles if you’d like. And you can also select other titles to convert. On the left panel of the interface, the profile icon will open the profile library once triggered. 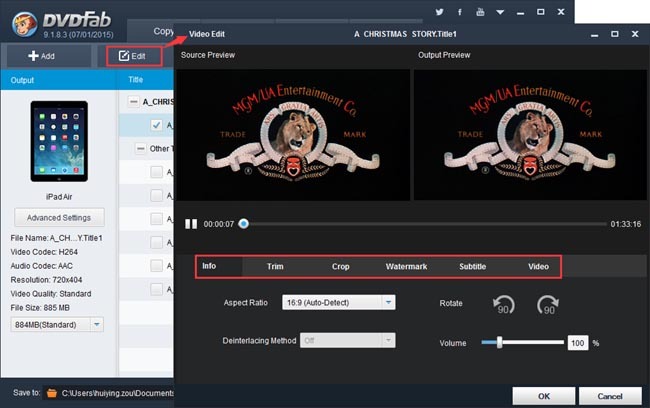 You can go to Format to choose a video format if you are clear about which format the output video should be in. Or you can just go to Device to choose a profile for your device, such as iPad Air. OK. Now click the Edit button on the top of the main interface to open Video Edit window, where you can change the volume, trim and crop the video, add watermark, load external subtitles, etc. Click the Start button on the main interface to start conversion. During the process, you can view the progress info, and preview it in real time if you want. Here is another neat feature of DVDFab: you can set your PC to shut down or hibernate when all tasks are done, so that you don’t need to sit in front of your computer and wait.